One of the joys of the 1980s/90s was seeing the portly journalist Roger Cook with a mouthful of hard evidence chasing crooked individuals down the street. This was on TV, of course, not down our respectable street where the only argument we remember was over a missing tin of Pease Pudding. Anyway, The Cook Report was a wonderful piece of investigative journalism, but also quite hilarious. No matter what Cook threw at the conmen, they would vehemently deny every single accusation and claim to be a victim of Cook. Occasionally, they also punched him in the face. Channel 4 decided that the show was ripe for a spoofing and spoof they did, first with This is David Lander and then This is David Harper. This is David Lander/Harper followed David Lander (Stephen Fry) or David Harper (Tony Slattery) as they investigated dodgy business practices and the individuals behind them. Subjects at the scrutiny of either Davids included: fine art theft, schools for young genii and housing developments prone to arson attacks. 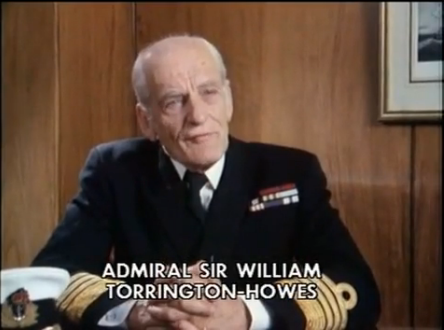 The show was a mockumentary and followed the format of The Cook Report very closely featuring interviews with victims, background investigations and finally a confrontation at the end. 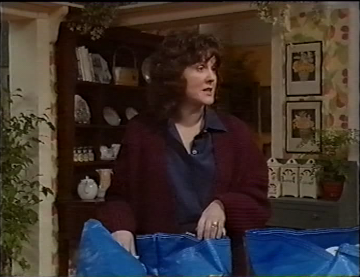 Many established and rising comedy actors feature throughout the series such as Caroline Quentin, Tony Robinson and Neil Pearson. We were also overcome with joy when we saw a brief cameo from Ian Sears of Johnny Jarvis fame. Curiously, Stephen Fry was unavailable for the second series, so the show was renamed with Fry's erstwhile Footlights colleague Tony Slattery in the lead role. The origins of This is... can be found in the BBC Radio 4 show Delve Special which featured Stephen Fry as David Lander and ran between 1984 - 1987. 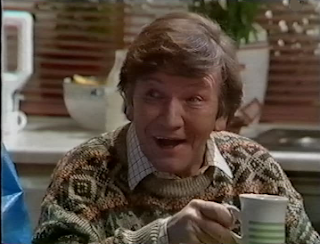 Delve Special was written by Tony Sarchet who had previously written for Jasper Carrott and Spitting Image. 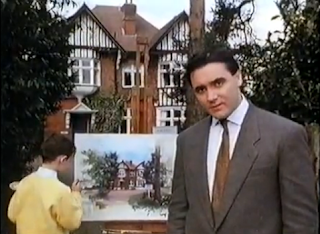 Sarchet felt that the idea was strong enough to translate to the small screen, but strangely, the BBC did not and, instead, Channel 4 aired the show in 1988 and 1990. A total of 12 episodes were produced by the comedy powerhouse Hat Trick. Both series were later repeated on the Paramount Comedy Channel in the late 90s. The repeats aired on the Paramount Comedy Channel were Curious British Telly's introduction to the world of investigative Davids. The Paramount Comedy Channel (now Comedy Central) was a treasure trove of cult comedies during the late 90s airing a mixture of British and US shows such as Monty Python, Drop The Dead Donkey and Duck Man to name but a few. School holidays always meant staying up late for Curious British Telly and - in the absence of the internet - we would while away the hours with Paramount. They were formative times indeed and This is David Lander was one show which really stood out. Tony Sarchet is on excellent form throughout This is... and his writing really defines the show. It's quite simply hilarious and at first glance, you'd think sections of the show had been lifted from Brass Eye, The Day Today or Big Train. However, This is... predates those three shows by several years and it's a shame that Sarchet didn't do more on British television. He shows here that he's capable of creating wonderful microcosms where the most ludicrous events can take place. One of our favourite scenes of This is... sees an interview with a man who's had monkey testicles implanted in his cheeks as part of weight loss therapy. When not creating surreal images, Sarchet is poking fun at the ridiculousness of authority such as the salty sea admiral who claims "It's bloody rude!" for taxpayers to complain about how their money is spent. After all, "They've handed it over.". Stephen Fry and Tony Slattery are the face of This is... and their deadpan presentation is the perfect helm for the show. We prefer Fry's Lander as he comes across slightly bumbling and terribly English whereas Slattery's Harper is more of a hardnosed individual. One slight issue with both David's is that we don't really get a true sense of the character. There's no background revealed to indicate his drives and passions. We're not looking for Alan Partridge style revelations here as they would spoil the realism of the production. Something more along the lines of Louis Theroux and his self-deprecating humour would have helped define the character more. Having aired a couple of series, and with Stephen Fry at the helm, we were surprised to find there had been no commercial release of This is... We'd love to see it, but the lack of interest online is likely to be the reason why. 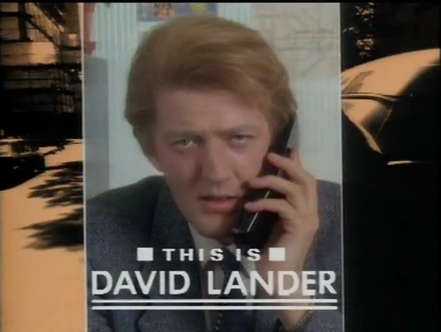 The complete series can be found on YouTube, but annoyingly, the David Lander series is blocked in the UK by Channel 4 due to copyright reasons. It's possible to use a proxy website to get around this, but you sometimes have to persevere with videos stopping after five minutes. Why the show isn't on 4OD is another question we'd love to know the answer to. Hopefully it will be one day. The David Harper series isn't - for some reason - blocked on YouTube, so that's available for you to soak up it's confrontational charm. One of the shows which kickstarted Curious British Telly's descent into half-forgotten TV hell was the mysterious Sebastian the Incredible Drawing Dog. A show that we could vaguely remember enjoying from our youth which featured Michael Barrymore and art. 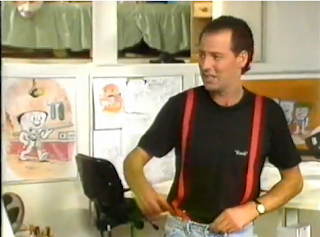 One day, whilst flicking through some old Radio Times at the British Library, we stumbled across a children's TV show which, again, consisted of Michael Barrymore and art. We almost fell off our chairs at the prospect of another Barrymore show to investigate, but thankfully we weren't drunk and remained seated. The show in question was Mick and Mac, so let's take a look. 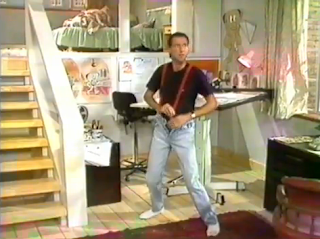 Mick and Mac is set in delightful apartment of the time - complete with avocado green bathroom - which is home to the cartoonist, Mick (Michael Barrymore). Strangely, Mick's drawing board is also home to a miniature Scottish character called Mac (David Jarvis). The show starts with a bit of banter between Mick and Mac before Mick sits down to draw a cartoon. These cartoons feature the Mac family on mild adventures. They're most static cartoons, but there's the occasional bit of animation such as the character's mouths moving. Following this cartoon there's a Barrymore solo piece where he goofs about trying to complete tasks such as wallpapering or hoovering. 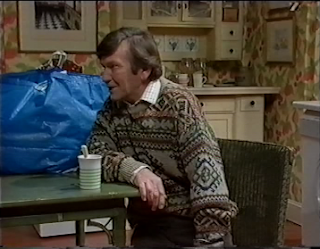 Mick and Mac ushered in the 1990s with its first episode airing on 3rd January 1990. The series consisted of twelve 10-minute episodes and was part of the CBBC programming on BBC1. Directing the proceedings was Nigel Douglas whose impressive CV includes work on Grange Hill, Going Live, This Life, London's Burning, Eastenders, The Bill and Wild at Heart to name but a few. 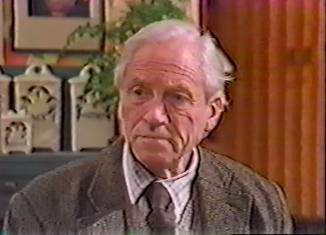 The writing duo behind the show were Geoffrey Atkinson and Andy Walker - we can't find any information on Andy Walker, but Atkinson has a long list of credits in sketch shows and even Sky's infamous sitcom Heil Honey, I'm Home! Curiously, the credits list 'The Mac Family' as being devised by Michael Barrymore, but, as we'll learn, this wasn't strictly true. Curious British Telly must have watched Mick and Mac at some point when it was on, but the only thing that rang any bells was the design of the set. YouTube is home to a 20 second clip of Mick and Mac, but that's pretty much all we could find online aside from a few murmurings on internet forums. 20 seconds of footage gave us very little to go on, apart from providing some screenshots, so we had to saddle up and head to the BFI archive to investigate. The technician at the BFI actually asked "What on earth are you watching today?! ", which led to a wry smile from us, but also some fear that we were in for something less curious and more baffling. The show is very reminiscent of Sebastian the Incredible Drawing Dog, featuring Barrymore, slapstick and a cartoon in the middle. However, where that show had plenty of interaction between Sebastian and Barrymore, there's very little interaction between Mick and Mac. In fact, in the episodes we watched, Mac is barely present at all beyond the first third of the show. 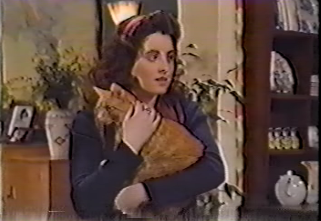 We think this is the major stumbling point of the show as Barrymore needs to be bouncing off other people. Mick and Mac leaves him to his own devices for far too long and he just can't carry off the slapstick sequences on his own. He's a great presenter, but he's certainly no Rowan Atkinson when it comes to a silent performance with inanimate objects. The cartoons featuring the Mac family aren't particularly strong either and we can barely remember them a week later. Overall, we were disappointed by Mick and Mac and think that the BFI technician was right to be bemused by our viewing choice. There was potential in Sebastian for Barrymore to be at the helm of a great children's show, but Mick and Mac just doesn't play to his strengths as an individual. Maybe we watched a couple of weak episodes, but they were episodes one and two, so it's not a great start to the series if so. Bringing Mac into the show more would have helped, but his existence as a miniature character living on a drawing board rather limited the role he could play. You have to understand that Barrymore in 1990 was becoming a huge name on British television and this was years before any of the scandals landed which blighted his career. If the right format could have been found then we we think a very special show could have been made. Sadly it didn't, so it will have to be filed as one of the missed opportunities of British television. We would be very interested in viewing some more episodes of Mick and Mac to get a better feel for the show, so if you have any footage please get in touch. Director Nigel Douglas spared us some time for a quick chat about the series for which we are eternally grateful. CBT: You’ve had a long and successful career behind the camera, but what first piqued your interest in directing? As a child did you pick up an 8mm camera and try to remake Ben Hur in your garden or did this passion develop later on? Nigel: I began my career as a director in Theatre in fact although my interest in writing pre dated that. Throughout my school years I was always more interested in the way school plays were produced rather than being in them. I started writing in earnest at University and was fortunate enough to have a couple of plays produced. This led to me wanting to direct theatre. It was really a piece of good fortune that saw my move to the screen. 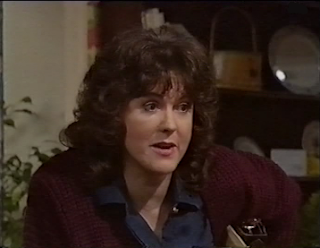 Angela Beeching, who was then producer of Jackanory, was looking for someone as an Assistant Producer who could abridge and adapt Children’s novels for the programme. She had seen one of the plays I had written and directed and offered me a six month contract. I stayed in Children’s television for around 3 years then directing The Satellite Show, Going live, FLIP, Mick and Mac, The Biz and Grange Hill before finally getting a break in the adult world on Eastenders for producer Jane Fallon (Ricky Gervais’ partner) who I then went on to direct This Life for. The rest as they say is history. A quick flick through your CV reveals that you had worked on several BBC1 children’s shows leading up to Mick and Mac, so was it this good relationship which led to you getting involved with the show? There was a series of factors that led to my involvement with Mick and Mac. I had begun developing FLIP when Chris Pilkington, the exec producer for children’s light entertainment, approached me about working with Michael Barrymore. They had had several meetings prior to this and Michael was keen to expand his workbase. I liked Michael’s comedy work and could see how this might be incorporated into a tv programme. I was also working a lot for Chris Pilkington at the time so it became obvious this was meant to be. We noted – in the credits – that Michael Barrymore devised the Mac family, so was he behind the show’s inception or did he come on board later? No, Michael was not particularly involved in the concept or development of the show. Often major stars, as Michael was then, are given additional credits to help get there fee closer to what’s required. Michael was earning 8k a night then and children’s tv had relatively small budgets. Of course, once we got closer and into rehearsals the content was almost entirely driven by him. Michael Barrymore had been hosting Strike it Lucky for a few years by the time Mick and Mac came along, so it’s fair to say he was already a household name. How was he on set? A consummate professional? Or maybe a diva demanding nothing but blue M&Ms? Michael was an absolute pleasure to be with from beginning to end. I had worked considerably with many of the “alternative” comics of the day such as Steve Coogan, Harry Enfield and Mel and Griff, but I have to say nobody had made me laugh as much as Michael. We would often have to stop rehearsals because he and I would be laughing too much to remember what we were rehearsing. 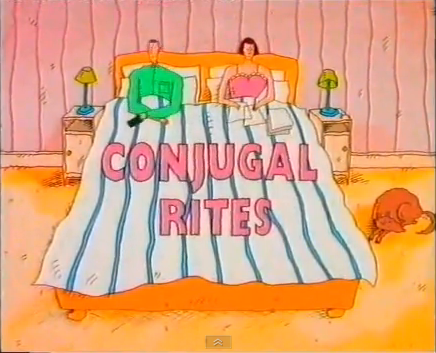 Of course, most of this could not be put in a children’s comedy show. He was very professional during the recording. Mick and Mac has a very slapstick feel to it with Barrymore bringing to mind the antics of Buster Keaton, Charlie Chaplin and Rowan Atkinson. Due to the physicality and reliance on props, was it a particularly difficult show to direct? All shows throw up different challenges to direct. The hardest thing with Mic and Michael was keeping Michael somewhere near the script. Often he would improvise and I’d have to just try and go with the flow. The programme was shot on 5 cameras at Pebble Mill so mostly I was directing from the gallery. 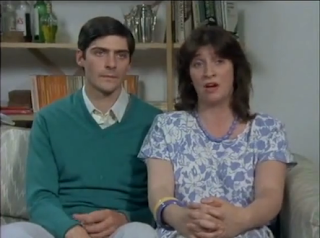 Just one series of Mick and Mac was produced, but were there ever plans to record more and, if so, what scuppered them? There was some discussion of a 2nd series but trying to find some time in Michael’s very busy diary was problematic. After that I think everyone just lost interest. Following on from Mick and Mac you’ve gone on to direct British institutions such as The Bill, Grange Hill and Eastenders. It’s not a bad list of credits, but what’s next for Nigel Douglas? I should say that the likes of The Bill and Eastenders are for most directors just fillers between the bigger jobs. I have been directing Wild at Heart in south Africa recently as well as the usual mix of Holby City, Casualty, and Waterloo Road. It’s impossible to say what comes next. I have just made my first return to children’s drama in 20 years and am currently in post production on the Christmas special of the BBC series “The Dumping Ground”. Many thanks for your time, Nigel!